Prolonged sitting is known to cause or aggravate a myriad of problems for our bodies including back discomfort, musculoskeletal and circulatory problems. We all know that getting up and moving about is best for our bodies – but – when we’re busy we don’t take breaks and just keeping working. Sound familiar? Getting up from sitting to stand or walk has many benefits. It improves spinal posture, reduces low back disc pressures, varies hip and leg joint positions, uses lower body muscles and increases leg blood flow. It also improves your metabolism and burns more kilojoules! Walking breaks are great, but as soon as workload increases it is likely they will stop. 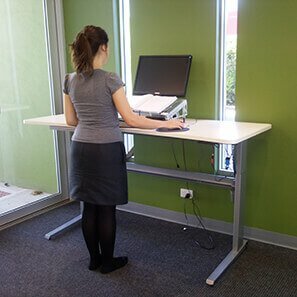 The best way to make sure that standing happens regularly, despite workload changes is to stay productive while standing. How? stand for paperwork. A cupboard, bookcase or 3-drawer filing cabinet these can be used as a standing work surface. 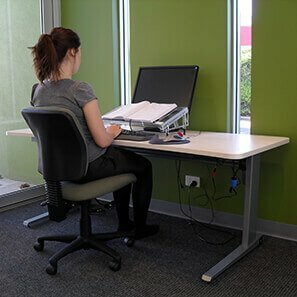 An Ergo-tilt used on the work surface will further improve your posture and the position of your work. Recently various studies have found that sitting for prolonged periods is not only bad for you back, but is also a risk factor for some serious medical conditions. One of these is deep vein thrombosis (DVT) or pulmonary embolism – usually associated with long haul flights. This is likely to be due to the reduction of venous blood flow that occurs while sitting, especially from sitting with legs crossed, from the edge of the seat or sitting in cramped conditions. Sitting for eight hours or more (as many of use do each day at work) can make you feel so physically tired that all you want to do is – sit! If your work is primarily desk based, find as many reasons as possible to stand. 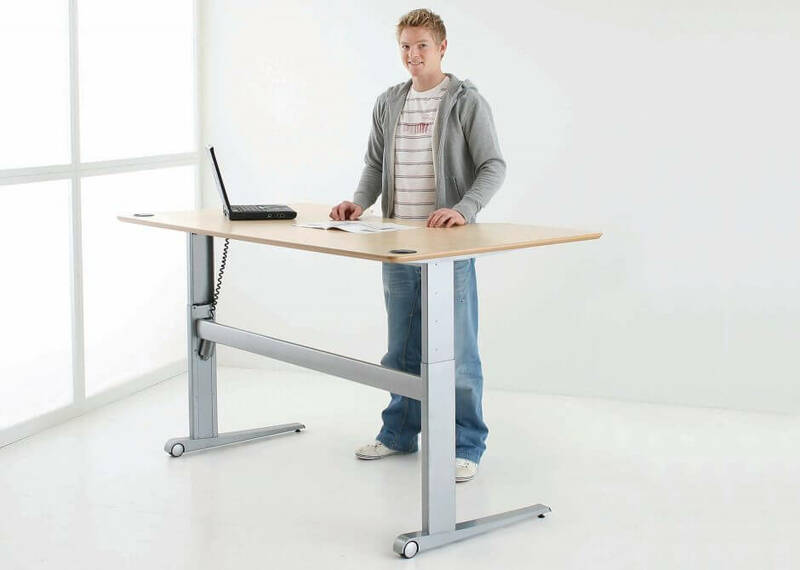 A Sit-Stand Desk is the ultimate solution for reducing sitting time. Work can be done while sitting, standing or perching – at the touch of a button.